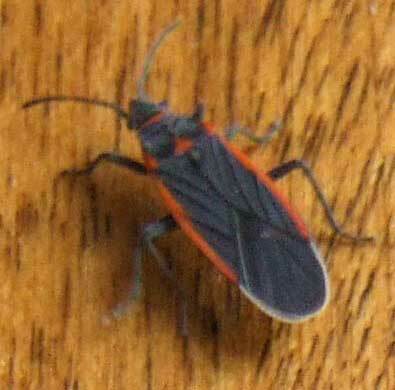 These bugs were very numerous in many locations across the Sonoran Desert after summer rains of 2008. They are attracted to lights and frequently end up inside where they may be seen as a nuisance. This photo was sent to arizonensis.org by workers in Cave Creek, Arizona. Seed bugs as their name implies feed on seeds. Several species, including the one shown here, can become very abundant when there is a crop of weed seeds to be had. Once the weeds dry out they move in mass to surrounding areas in search of food and moisture. Normally their impact on residents of Phoenix, Tucson, Casa Grande and other cities in the Sonoran Desert is simply a nuisance. However, if they become dehydrated they may seek moisture with their piercing-sucking mouthparts - a straw-like apparatus. If this search is into the skin of people they will feel a bite. No lasting harm is likely. The head of Neacoryphus lateralis is mostly black with a red collar, the pronotum black with red markings, and most of the wings are black except for the name-sake red lines along the lateral margins. The length is about 10mm. Most seed bugs can eject foul-smelling liquid if mishandled or attacked by an insectivore. Thus the red and black color which warns a would-be-attacker.